Five forms course Lusaka Zambia January 26 & 27 2019. CLICK BELOW TO DOWNLOAD FORMS AND REGISTER NOW. Incredible news! You don’t have to go to Russia to get world class courses, QD is bringing Russia to you! 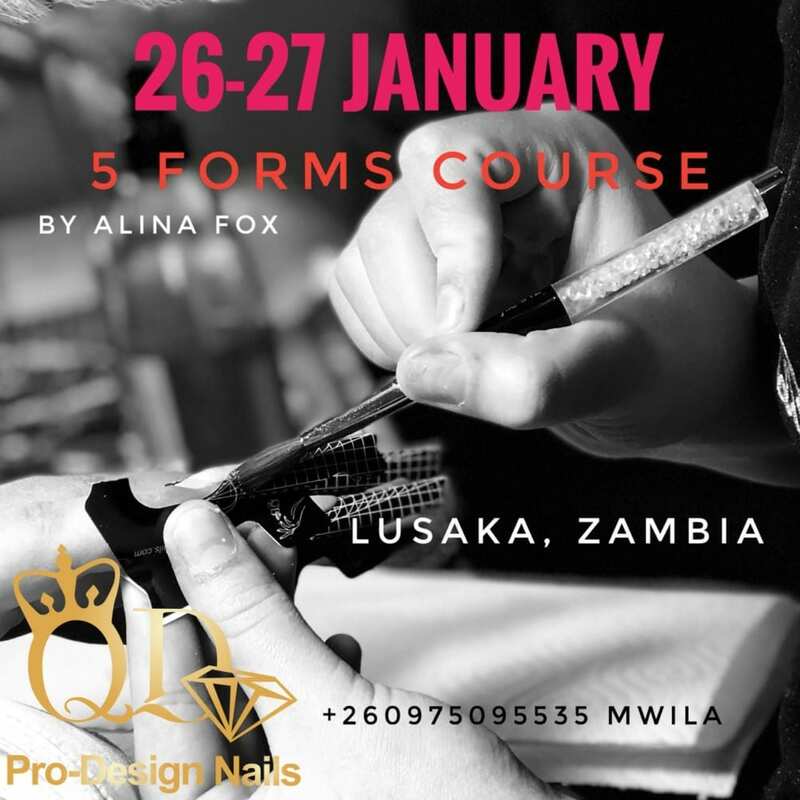 Alina Fox, will be conducting a Five forms course in Lusaka Zambia January 26 & 27 2019. Five forms course Lusaka Zambia January 26 & 27 2019:- French arch in acrylic. The course suits experienced techs and technicians who trained some time ago, who wish to learn new techniques and improve their skills. The course assists in creating beautiful “smile lines” and to model long, strong but at the same time very elegant and comfortable nails. THIS COURSE IS NOT FOR BEGINNERS AND REQUIRES AT LEAST 2 YEARS EXPERIENCE. Cost R3,400.00 including lunch. KIT INCLUDED. All products for use in course will be included. Don’t miss this opportunity, proudly brought to you by QD pro design nail academy. Snooze and lose as spaces are limited. Five forms course Lusaka Zambia January 26 & 27 2019, course for experienced techs! Educator-Alina. This educational five forms course training program using Acrylic, which is two full days of intensive, hands on training with live models on day two, is a must for anyone who uses or wants to use forms and learn the most popular and beloved shapes out there! Each student will first of all learn about forms. how to fit and work with them. They will learn how to sculpt 5 different shapes properly and correctly. Models are required for day two. The first day:- Theory and introduction to various products. Ballerina shape, Stiletto, Salon square shape. Day two:- Practical hands on training using a model. Russian almond and salon almond. Bring a cell phone and a charger to make pictures and videos. A note book is also a good idea. Please join us for this great course, this is a brand new course which is bound to be incredibly popular. Spaces are limited. Don’t miss out on what is sure to be a memorable two days. You will not regret it. Hi Pamela. That is an admirable aspiration. We would be very pleased to see you at one of our courses. Hi Angela. Yes a certificate will be presented.